Vasyl Hryhorovyc-Bars'kyj was a Slav mendicant pilgrim whose travels lasted twenty-four years between 1723 and 1747. They took him from his native Kiev through eastern Europe to Italy, where he worshipped at Christian shrines in Bari, Rome and Venice. 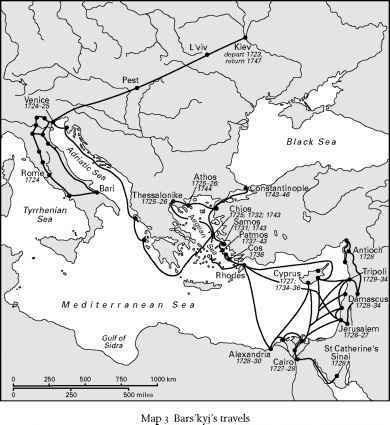 He then travelled to the Holy Land, en route spending time in the Greek islands; he also spent two extended periods living on Mount Athos, visited Cyprus onthree occasions, and travelled extensively throughout Greece and Asia Minor. He spent some time in Constantinople from where he returned home to Kiev.1 While pilgrimages were common in this period, both by religious zealots and by curious travellers, Bars'kyj's pilgrimage was unusual in both its duration and its scope, as well as for the detailed written and illustrated record that he kept.2 It was also unusual in that he wrote as an Orthodox traveller, who throughout his journeys sought out Orthodox communities and recorded their customs, churches, liturgies and traditions of worship from the perspective of a passionate insider, rather than as a curious outsider. 1 See T. G. Stavrou and P. R. Weisensel, Russian travelers to the Christian East from the twelfth to the twentieth century (Columbus, OH: Slavica, 1986), 70-3. 2 His untitled travel journal, usually referred to as 'The travels of Vasyl' Hryhorovyc-Bars'kyjin the holy lands of the East', survives in the autograph manuscript of over 500 folios, or about 240,000 words, and is accompanied by scores of painstakingly accurate archaeological drawings mainly of churches and monasteries. The autograph manuscript is in Kiev at the Akademiia Nauk Archive, Kiev v, No. 1062. The most accurate published edition is N. Barsukov, Stranstvovaniia Vasil'ia Grigorovicha-Barskago po sviatym mestam vostoka s 1723 po 1747 g., 4 vols. (St Petersburg: Pravoslavnoe palestinskoe obshchestvo, 1885-87). References will be given below to the manuscript and not to the printed edition.